Call the professionals at Jason Brown Wood Floors for your expert hardwood installation today! Installing new hardwood flooring can be exciting. After all, you’re giving your home a brand new look just in time for holiday visitors to come and see all of the new changes. Here are some tips to help you with your hardwood flooring journey. Once you have decided to have hardwood flooring installed, you have some other decisions to make. For instance, you need to decide if you will do it yourself or call in the experts. If you rely on professional expertise, take some time to anticipate what it is they will need to do. Consider how many floorboards they’ll need to remove. The professionals at Jason Brown Wood Floors are here to make sure your installation goes smoothly! Depending on what rooms are getting the new floors, you will need to clear those rooms out. For some rooms, this task is easier said than done. You will need to remove furniture, wall hangings, other decorations, and anything hidden in the closets. If there’s no other usable space to move things to, then you’ll probably need to rent a storage unit for the time being. While your pets will be curious about all of the noise and activity that comes with installing hardwood floors, you don’t want them to get in the way. If they do, they could get hurt, or distract the workers. 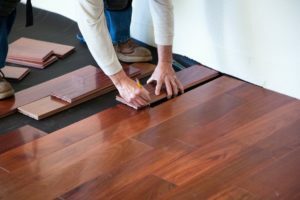 Depending on the type and amount of flooring you choose, the installation process could take a lot of time, or it could be done in a day or two. Talk to your installer and they will be able to help you decide if you should stay elsewhere during your flooring installation. This entry was posted on Friday, November 16th, 2018 at 3:35 pm. Both comments and pings are currently closed.